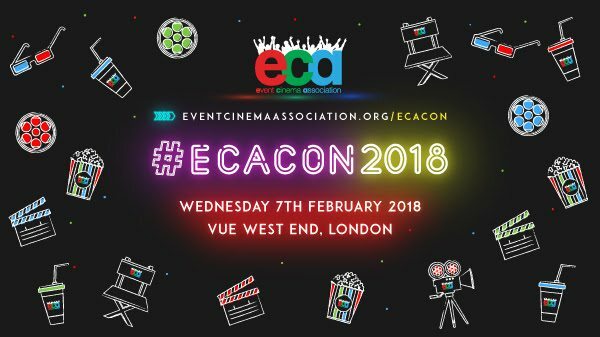 London, UK (January 23, 2018) – The Event Cinema Association have announced the schedule for their annual conference, which will include networking sessions and talks from prominent industry leaders. The conference will take place on 7th February at Vue West End in Leicester Square, London. Now a highlight of the Event Cinema industry calendar, the conference is in its 5th year and brings together a diverse range of content producers, technical providers, distributors and exhibitors from all over the world. The conference, hosted by John Rubey of Rubey Entertainment, formerly of Fathom Events, is set to run from 9am to 5pm and will comprise of 4 sessions, broken up by networking opportunities, lunch and drinks. The first session, which will be delivered by James Dobbin of Showcase Cinemas, Johnny Carr of Vue Entertainment and Karen Liu of Odeon Cinemas, will give ECA guests an insight into the direction in which cinema will move in over the next ten years. Following this will be the chance for attendees to discuss issues that have arisen with tech, content and revenue in the past with a panel of experts. IT support guru Ben Rapp of Managed Networks will bring data protection and Data Reminder to the fore in session 2. Joe Evea and Jan Runge from the event cinema platform Cineplace will host the industry panel before lunch, where audience questions can be addressed. The post lunch itinerary includes surgeries from founder of Strike Media and My Film Club App, Wez Merchant, and other industry leaders from legal, technical, funding and web design backgrounds. The afternoon sessions will host the ECA Box Office Awards, sponsored by Encompass. Conclusively, five international speakers who will discuss the topic of ‘Windows on the World- What Works In Different Territories?’ There will be market focus from Brad LaDouceur of Cineplex Canada, John Rubey of Rubey Entertainment for the North American market, Thierry Fontaine of Pathé Live for France, and in an industry first, Adon Quinn of Emaar Entertainment will present an overview for the Middle East and Claire Gandy of Event Cinemas and Janelle Mason of CinemaLive will shed some valuable light on the Australian market. Complimentary drinks can be found at the Vue Bar. Graham Spurling of Irish circuit Movies@ will deliver the closing speech. Networking will continue at All Bar One where connections made earlier in the day can develop. The ECA Conference is supported by Vue, Cinema Next, Éclair, Cineplace, Motion Picture Solutions, Jack Roe, Coca Cola and Molson Coors among others.